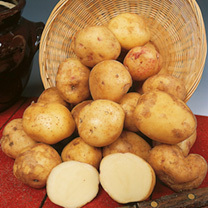 High yields of large, round tubers with excellent resistance to disease and stores well. Boil, mash, saute, bake or roast. Blight tolerant. Colour - white, red eyes. Shape - short oval. Maincrop variety. Not available for despatch to Northern Ireland or Eire. Order Despatch - Seed Potatoes are sent separately, in specially secure cartons, and will be despatched from December onwards, weather permitting. Please note that we monitor weather conditions daily during critical periods and do not despatch when frosty periods are forecast.